Correct Wheel Sizes, PCD, Offset, Rims and Tire specs for Tata Nano series. Can you tell me the Axle size of TATA NANO ? Front Axle: 1325 cm; Rear Axle: 1315 cm. Sir, what is rim weight of 135/65 R12. With its type of material. Hi,Ganesh,The weight is about 9-10kg per pieces.For the material,Normally it is rubber,But also have many other elements. Thank you sir, but I want the information about the rim width of 135/60 R12 ? and the weights at which the rims are available in the same size ?? Hi,Ganesh,The rim width for that tire is 3.5-4''.the rims weight is 9-10kg. Sir, which material advisable for low weight rims and cheap in prize if so??? Hi,Ganesh,Normally,The price is depend on the wheel weight in the same standard condition.The lightest wheels is forged wheel,It made of alloy.it is also the most expensive,The most heavy wheels is steel,It made of steel.but steel wheel is the cheapest. sir what is hub dimension of 135/70R12. Sir, actually I and my team are making a single sitted solar vehicle for which we need a help to select a wheel of light weight. I have done some work according to it I have fet to know that the tyre must be 135/65. Is there any other choice for ground clearance must not be more than 15cm?? Hi,Ganesh,For the tire size,just need it compatible.You want to make your car ground clearance more than 15cm,you can use high profile tire,means the tire aspect ratio will be higher and width will be smaller.But,In fact,the tire width 135mm is difficult to find,Normally,the minimum is 145mm,So you can try to find 145/65/12. Thank you sir, but is there any calculations like finding traction if so how can I calculate them??? Hi,Ganesh,For finding traction,I have not that calculations,The data i send to you is for normal cars.I have no idea how your solar vehicle is made,But i think may be this data can help you. 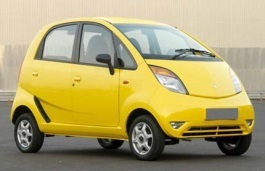 Can someone tell me the offset of tata nano rim. Can somebody help me with the PCD for Tata Nano XTA (2016)? Can you also let me know whether the same is different for different models (year wise)/variants? I hope not!